Can I please see some ID? I clearly remember being 17 years old and wanting to go into the bar in Toronto to go dancing. Certainly not for the alcohol, just the dancing. Or at least I am sure that’s what I told my mom. At the time, in Ontario, I needed to be 19 years old to get in. So how could we get around the law? Easy. 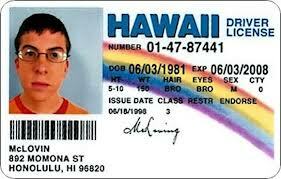 Fake ID. What was the big deal? Everyone did it. Right? Well it was a big deal because it constitutes breaking a law. And though most kids never got in to any kind of trouble, the bar could have been held responsible for who they let in. Since we were under 18, our parents would have also been responsible. No 17-year-old evaluates all these things if they decide to doctor their IDs. Advance a few decades to Social Network sites. How old does one have to be to be on Facebook? Google+? Or My Space? Thirteen. One-Three. Not age 9 with a parent’s permission. Not age 11, but only if you are a ‘really good kid’ and ‘you are friends with your parent’. Age 13. Yet there is a huge demographic of kids UNDER 13 on the site. How do they bypass the rules? In most cases, their parents sign off that their kid was born in the year that allows them to be 13. This doesn’t seem like a big deal, much like my old fake ID, but consider this: As a parent, you are signing a legal contract under the Terms and Conditions that indicates that your child is born earlier than they were. So in 2013, you have said your child is 13 when they may be only 11. Come 2018, a switch will fire in the system that indicates that child is now an adult. All sorts of additional content, advertising and features are suddenly available to your 16 year old child. If any trouble were to arise from the interactions from this additional content, it could get blamed on the parent since they legally agreed that their child was born in 2000. Food for thought: Even though all their friends are doing it, or it seems innocent, keep in mind that signing a child up and lying about their birthday could expose your under-aged child to adult content or permit their information to be used publicly when their ‘computer age’ becomes 18.